Inscrutable or just a bit daft? 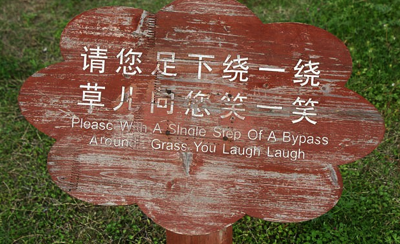 They do say that the Chinese are inscrutable don’t they! Confucius wisely said this and that when not saying much at all didn’t he? I tend to think that the Chinese inscrutability of Confucius and his modern day pals is probably down to problems in translation rather than anything err… Confucianian! Does this picture prove my point? Confucius said. “Ignorance is the night of the mind, but a night without moon and star.” I’m sort of with him on that after the confusion over a bit of grass.